By Dennis G. Molinaro, Published by the University of Toronto Press. Section 98 of the Criminal Code of Canada was passed in 1919 following the Winnipeg general strike as a law aimed at ‘unlawful associations.’ Its very broad definition of unlawful association meant that it could be used against a wide variety of opponents of the status quo, including the Communist Party of Canada, left-leaning organisations of various kinds, and labour leaders. 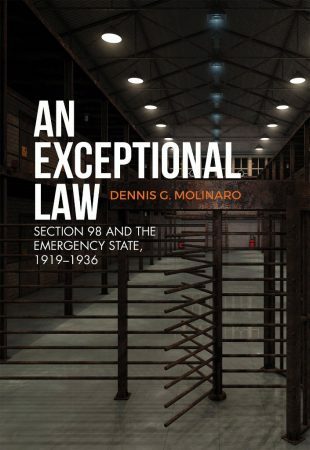 Although it was justified as part of the state’s ‘emergency powers,’ it became, Molinaro argues, ‘normalised’, part of the ordinary fabric of mainstream society’s approach to dissent. Like other recent Osgoode Society publications, especially Security, Dissent and the Limits of Toleration in War and Peace: Canadian State Trials Volume IV, 1914-1939, An Exceptional Law provides a deeply-researched historical account of a current much-debated question – where is the line between freedom and security to be drawn in a liberal democracy?